WELCOME TO CLAYTON FARMS. We are so happy that you are making our CSA an addition to how you eat this year! 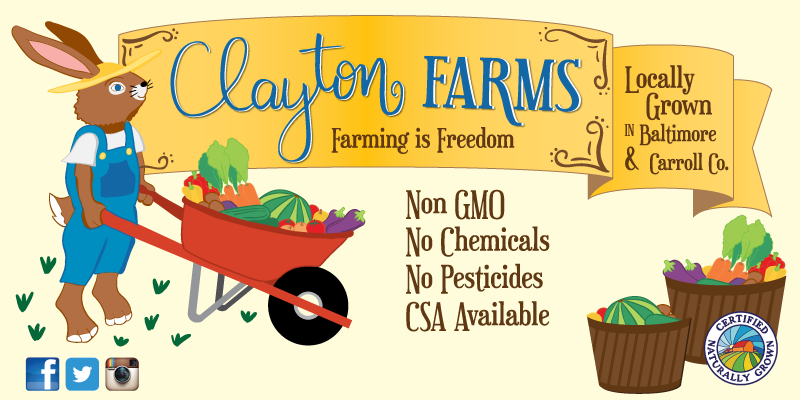 We are committed to providing you with a wide variety of produce that is FREE of GMOs and grown without the use of synthetic fertilizers or chemicals. We will provide you, the member; with naturally grown vegetables, freshly harvested at their peak, insuring great taste and the highest level of nutrition. It is the member’s responsibility to pick up their share within the time frame for each pick up location. ***New option: Hassle Free DELIVERY option for a fee of $220 for the season which breaks down to only $10/week! *** You will receive a portion of our harvest weekly for 22 weeks, from June through November. There is no guarantee on the exact amounts and types of produce you will receive each week. This agreement outlines our shared and legally binding commitment to that relationship. Please let us know if you'd like to change your pickup location.